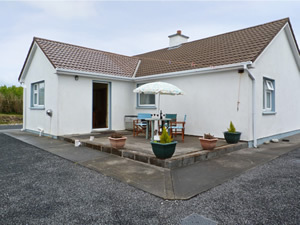 This fabulous chalet is located on the grounds of the owners home with separate entrance 2.2 Miles from Achill Sound, 30 miles from the lively Westport. It is tastefully furnished inside with large cosy lounge with lots of videos and DVDs to watch during your stay and a large patio area at the rear ideal for those fine summer evenings with a bottle of wine and take in the breathtaking views the property has on offer. Achill Sound has lots on offer from fantastic beaches all within a short drive, many good fishing spots, and at weekends traditional music is on offer. A couples haven and a holiday to be remembered for a long time, a camera is a must!Shop. Pub. Restaurant 2.2 miles. Beach 5 miles. GF: lounge, kitchen/diner, double, twin, bathroom.Electricity and oil central heating included, open fire with starter pack, linen and towels included, cot, high chair, TV, video, dvd player, radio, CD, freezer, microwave, w/machine, dryer, hairdryer, welcome pack, partially enclosed garden, patio area, patio furniture, private off road parking. Sorry no pets.